From left: Tom Tipton, Travis Long, and TJ Edson of Out of the Blue Too. CAMBRIDGE — It’s gray outside in Central Square, but inside a vast space on Massachusetts Avenue the view is dazzling. Brightly hued T-shirts emblazoned with the locally ubiquitous “NOT ART” stencil hang from the ceiling’s acoustic tiles. A hut juts out from one wall; jewelry, paintings, old records, and sweat shirts await browsers. A large dog wanders around, sometimes stopping to get petted. Visitors wander in, intrigued by the vibrancy visible from the street. This is Out of the Blue Too Gallery, carved out of a Central Square storefront. Artists rent out stalls where they can sell their wares, while other community members host events: storytelling, poetry, tarot card readings. And since opening in 2014, the gallery has become a reliable spot for all-ages concerts, featuring bands from Boston’s burgeoning underground and beyond. On Friday and Saturday, Out of the Blue Too will host a two-day, two-stage festival, called Fools Fest in honor of its April 1 opening date. 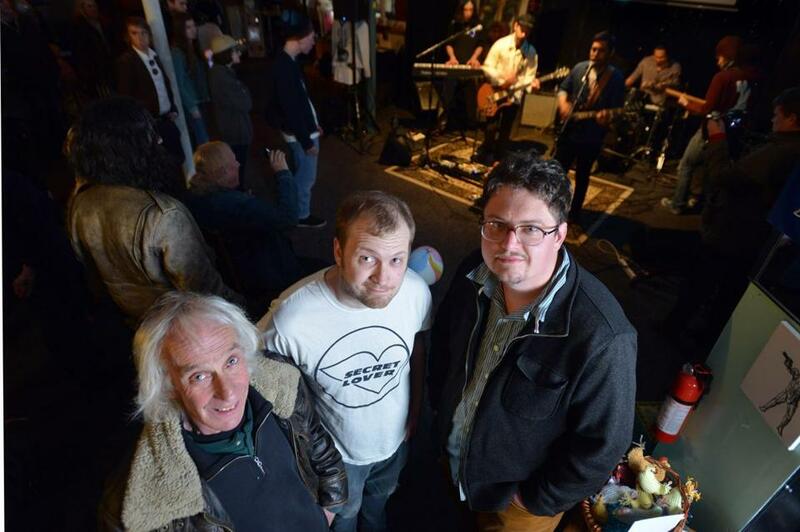 The roster is long, and touches on a wide number of subgenres; Northampton electro duo Home Body, dream-pop outfit IAN, “storytelling-bluegrass-really weird” act Frank Hurricane, and high-energy punk rockers Midriffs are only a few of the acts on the bill. Tom Tipton, a musician and poet, opened the original Out of the Blue on Brookline Street in the late ’90s. A few years later, the gallery moved to Prospect Street. In October 2014, Out of the Blue — now with a “Too” added to its name — opened in its current home, a former Blockbuster Video that had been vacant for years. Some structural trappings of the chain store, which during its ’90s heyday was accused by many of homogenizing the home-video landscape, are still present. But they’re buried under artwork culled from a wide spectrum of cultures and disciplines. Fools Fest will operate in a similar way, giving anyone who drops by a chance to sample from a varied offering of independent music. A few months ago, the gallery’s principals formed Out of the Blue Community Arts Incorporated, a nonprofit organization that, Tipton hopes, will aid in sustainability and, eventually, growth. The community fostered by Out of the Blue Too will be on full display at Fools Fest, but quieter moments reveal the ever-widening resonance of its impact on Central Square, and Boston at large. “I walked in here several weeks ago on a Saturday morning, and two young girls from the area were singing,” recalls Tipton. “The P.A. was on, and a couple of friends were watching them. They had been wandering around the square with nothing to do, and they ended up in here and asked Eli if they could sing.